Some of the information in this update was provided by a KRISS SYSTEMS spokesperson, in response to my queries. 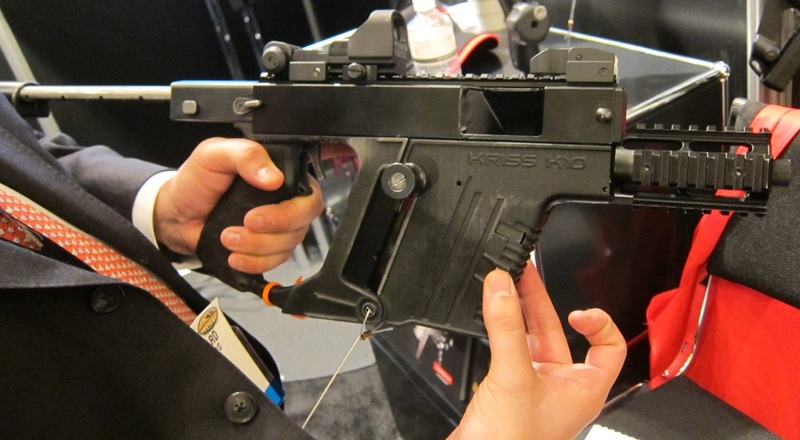 The KRISS K10, discussed briefly in my earlier piece here, represents the evolution of the KRISS Vector SMG. The K10 will be designed as a multi-calibre platform, supporting .45 ACP, 9x19mm NATO and .40 S&W. These three calibres are the most popular handgun cartridges in Western military and law enforcement use. The lower receivers will be interchangeable, allowing operators to easily switch between calibres, should they desire. The new submachine gun will also feature a quad-Picatinny rail fore end, giving the firearm a lot more flexibility for mounting aftermarket accessories. The K10 will, of course, be based around the KRISS Super V System (KSVS), making use of in-line design and asymmetrical recoil (the ‘vectored bolt’ technology) to greatly reduce felt recoil and muzzle climb. The K10 also features a much larger charging handle (that can be reconfigured to suit left or right handed shooters), a telescoping, five-position stock (unlike the Vector’s folding stock), an ambidextrous magazine release on the fore grip, and a muzzle designed to accept KRISS DEFIANCE series suppressors. A proprietary magazine is also being developed, and this will reportedly be interoperable with another KRISS weapon under development, the KARD. Limited information on the KARD can be found here, and here. I have been informed that the KARD is an ongoing project, and that no date has been set for its release as yet. A KRISS SYSTEMS spokesperson has confirmed that the K10 will be released next March, at IWA 2012 in Nuremberg, Germany. I have also been informed that there are existing law enforcement and/or military pre-orders for the system, and that the K10 will be first released in .45, with .40 and 9mm to follow. KRISS SYSTEMS are also releasing a new compact handgun under their Sphinx brand. The Sphinx SDP Compact in 9mm was presented at Milipol 2011 in Paris, last month, and will be officially released at SHOT Show 2012 in Las Vegas, in January. 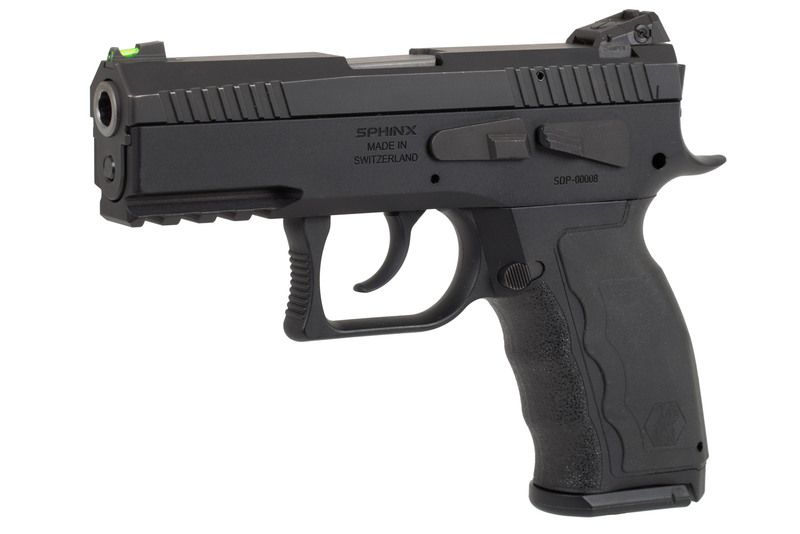 The Sphinx literature describes the SDP compact as an “all black pistol in Double-Action/Single-Action with an ambidextrous decocking lever and magazine catch featuring six safeties”. Interestingly, the pistol also features interchangeable grip inserts not only in a variety of sizes (S/M/L), but also in different materials (hard polymer, and softer rubber). The SDP Compact also features DEFIANCE’s combined fibre/Tritium front sight, and accepts compensators and DEFIANCE suppressors. You can find information on both here. K10 photo courtesy of Defense Review. Please note that the photo shown is a prototype displayed at SHOT Show 2011, and does not represent the final production version of the K10. Sphinx SDP Compact photo courtesy of KRISS SYSTEMS SA. This entry was posted in Weapons Systems by N.R. Jenzen-Jones. Bookmark the permalink. Thanks for this very interesting report. I forwarded this link to some gunsmiths in the US who like to stay current on information such as this. Thanks for the kind words, Don, and for continuing to follow the blog. I assume you’re talking about the K10? I’m still waiting on the official word from the KRISS SYSTEMS SA head office in Switzerland. I was told the launch would be this March at IWA in Germany, but no word yet on when it will be available for domestic (US) sales. The KSVS has optimised recoil, rather than ‘no recoil’, but it will certainly be lighter on the shoulder. If you’re particularly familiar with, or attached to, the AR platform, you might consider smaller-calibre AR conversions, such as a Colt or RRA in 9mm, or an AR FIVE SEVEN in 5.7x28mm (http://www.57center.com). Pingback: Weapon Design… | The Dark Side of Digital Art.